A Smile Makeover can transform your current smile into the smile you’ve always wanted. The Cosmetic Dentists at Natural Dentist Associates use many therapies including Porcelain Crowns, Porcelain Veneers, Dental Implants, Tooth Whitening, specialized Cosmetic Dentistry software and 3D X-rays to Diagnose and correct Cosmetic Dental Problems. There are many elements of a Smile Makeover. First, we identify all the Cosmetic Dentistry problems with your existing smile. Second, we listen to you and determine how you wish to change and transform your Smile. Finally, we create a custom Cosmetic Dentistry plan to correct all the cosmetic problems, and create the smile you’ve always wanted. 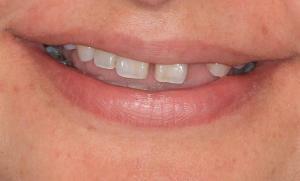 1) undersized teeth were corrected with Porcelain Veneers. 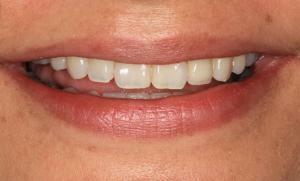 2) poor teeth proportions corrected by carefully planning the size and shape of the Porcelain Veneers. The teeth were widened to correct size and the tooth-width asymmetries. The teeth were slightly lengthened because they appeared too short. 3) missing tooth corrected with a Dental Implant and a Porcelain Crown. If Dental Implants are properly selected and placed, Porcelain Crowns placed upon them will look just as Porcelain Crowns on natural teeth. As you can see in the picture, the Dental Implant Crown looks the same as the natural tooth Crowns. 4) Discolored Teeth corrected with Tooth Whitening prior to placement of Dental Veneers (with careful color selection of the ceramic). Tooth Discoloration can only be partially corrected with Dental Veneers since Veneers are somewhat translucent. In many cases it is necessary to do Tooth Whitening prior to Veneers to achieve the desired tooth color change. In cases of severe Tooth Discoloration it may even be necessary to make the desired tooth color change with a Porcelain Crown. Cosmetic Dentists need to have a special eye for symmetry and detail and have a wide range of dental skills to be successful in more complex Cosmetic Dentistry cases. The case above, requires a Cosmetic dentist who has extensive knowledge in the overall bite and function of the teeth, placement of dental implants, skills in difficult crown and veneer cases involving length and width asymmetries and of course great communication skills to communicate with demanding cosmetic patients. Many extensive Cosmetic Dentistry cases are also better performed under Sedation Dentistry. Very few Dentists are certified to put patients to sleep with IV Sedation Dentistry. Natural Dentist Associates is a Dental Implant Center that offers Sedation Dentistry. Our Cosmetic Dentists have extensive experience with complex Cosmetic Dentistry Cases with changes in the overall bite and function of a full mouth of teeth.